HOME » Blog » What’s so special about Burma? 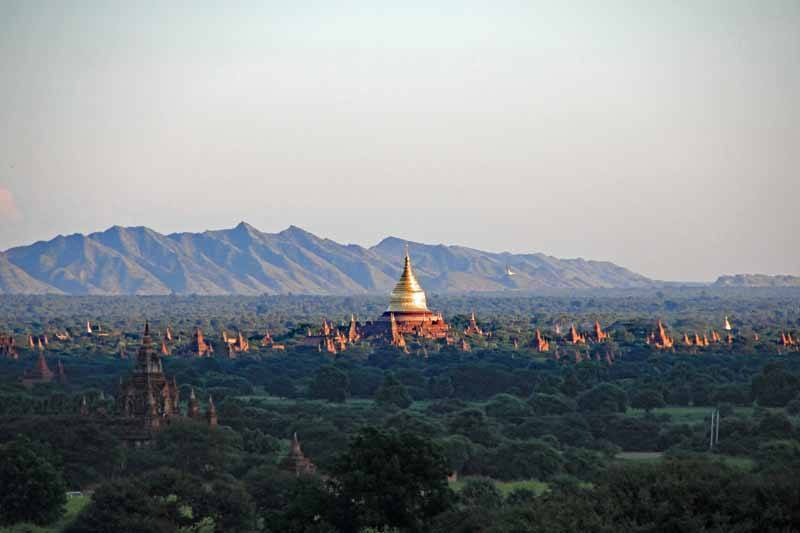 What’s so special about Burma? Lesley and Alistair Greenhill have travelled with Inside Asia Tours on three separate occasions: once to Japan, once to Vietnam and Cambodia, and once to Burma. Each time they joined one of our fabulous group tours, and made such fast friends with their tour mates that they’ve all been coming back again and again! 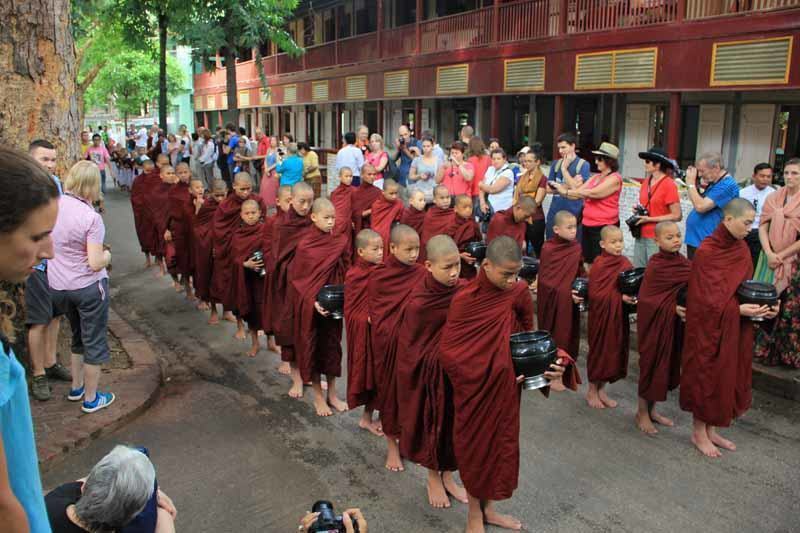 Here, Lesley explains what made their most recent trip to Burma so special. We have visited a number of countries in the Far East and Southeast Asia, so we set off for Burma expecting a similar experience. But Burma was a delightful surprise for many reasons. Here are just 12! There are tourists, but they are not buzzing around in anything like the numbers visiting the Angkor temples or the Bangkok Grand Palace. It is possible to wander among the small temples of Bagan and see only a few other foreigners gazing at the landscape and taking photos of ruined temples against a deep blue sky. 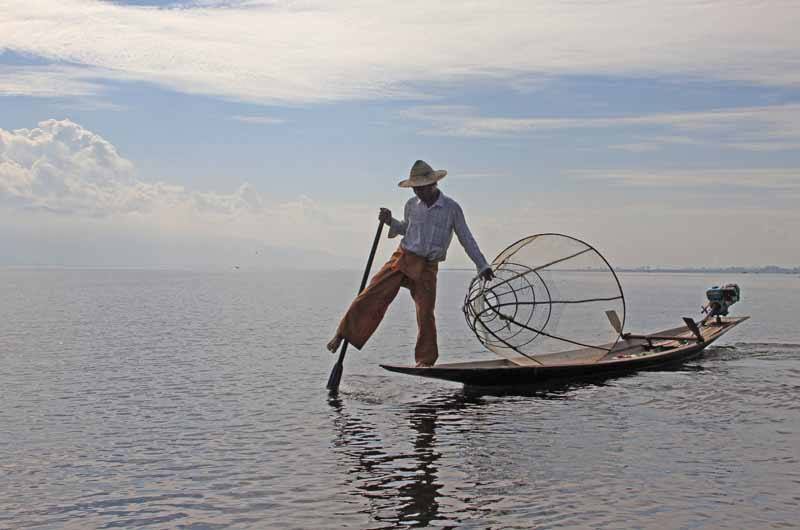 Or to sail on Inle Lake passing other tourist boats occasionally with a wave and a smile. Only the Shwedagon Pagoda in Yangon was really busy – but even here you could stroll around quite easily. Some places had hardly any tourists at all! Our Beautiful Burma tour group: some of the only tourists at Inle Lake! 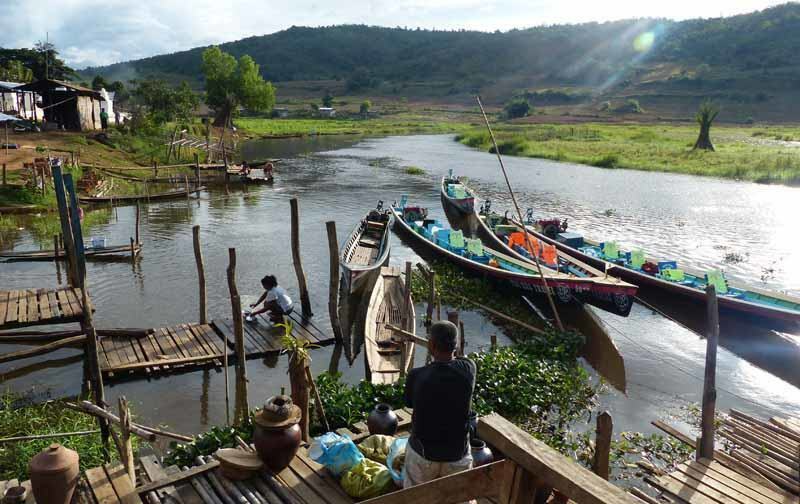 Because of the relatively small number of tourists in Burma it is possible to see the real working life of the country. 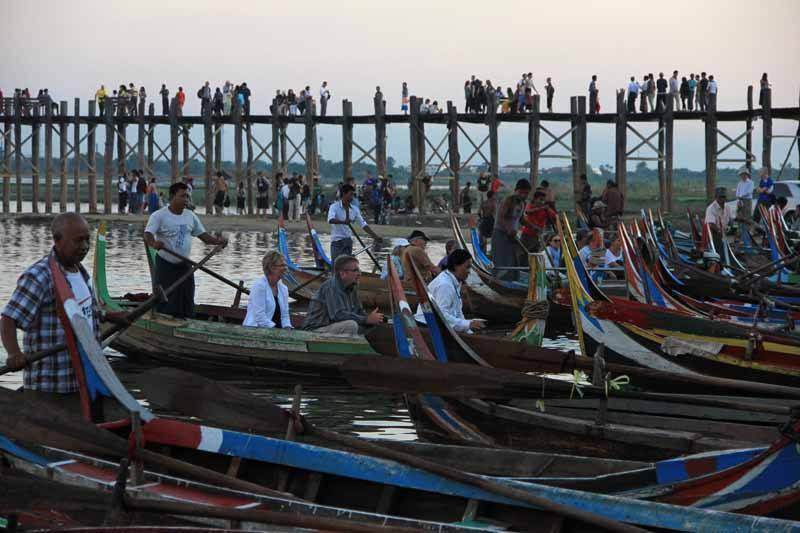 This includes being allowed to visit the Jade Market in Mandalay and observe the trading taking place. There is nothing for tourists to buy here, it is strictly serious business. 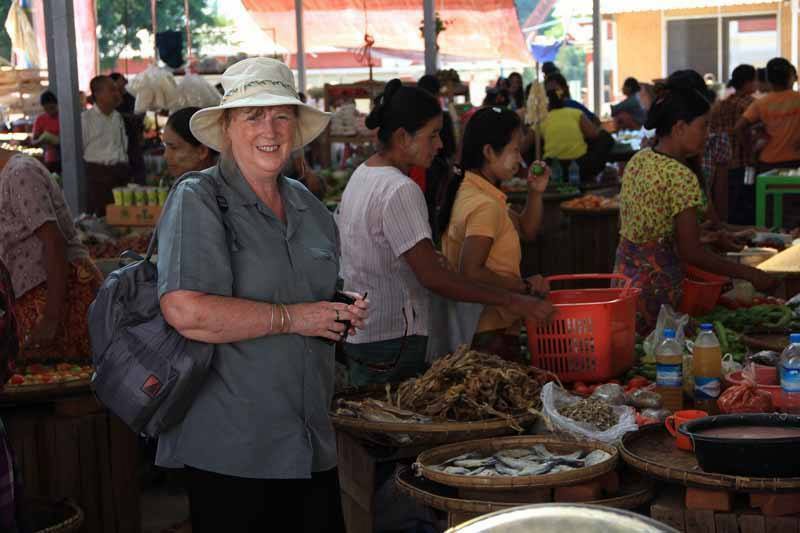 We visited markets where the majority of the goods are for the local people, with only a few tourist stalls. The Burmese are delightful and helpful, with a good sense of humour. Fortunately they have not yet become bored with visitors taking photos of them and their businesses. Except in Yangon, almost everyone in Burma wears the traditional Burmese longyi. Longyi are cool, comfortable and practical, easy to wash and dry, and elegant on both men and women. There are wonderful fabrics produced by different ethnic groups who can be seen wearing their traditional styles of clothing. The women, and some of the men, paint their faces with thanaka paste – which protects them from the sun, softens the skin, and has anti-fungal properties. The women make attractive patterns in the paste, often a leaf design. There are many skilled craftspeople creating beautiful items of lacquerware, woodcarving, jade, silk, parasols and beautiful fabrics, the most unusual of which is fabric made from lotus root fibres. This is a labour-intensive process so the resulting cloth is expensive, but unique. We also saw local snacks being produced in a family business, boat-building and pottery making. While parents are working the children stay close and help or play games. There are more pagodas in Burma than I could possibly have imagined – and yet they are all different. We had our sandals off and on more times than we could count. There are amazing Buddha statues, and wonderful wall paintings, carvings and gold leaf decoration. And Burma has embraced the modern approach, as Buddhas have halos of coloured, flashing lights as if they are in a disco nirvana. Shwedagon Pagoda at night has more fairy lights than the Blackpool Illuminations! And where else can you see the largest book in the world? This was a quite remarkable collection of over 700 stupas, each one containing a large stone tablet which has a page of Theravada Buddhism’s sacred texts. I’ve never seen anything quite like it. Buddhist monks were everywhere in their maroon robes and we were privileged to see over 1000 monks lining up for their meal at Mahagandayon Monastery. The majestic mountains of Kalaw are a beautiful backdrop to Ethnic minority villages. 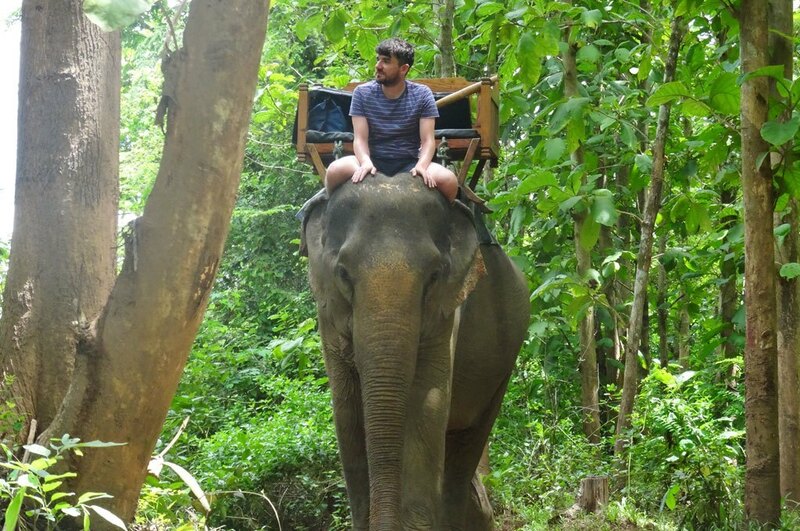 Here we enjoyed the beautiful countryside and had a wonderful visit to an elephant sanctuary to feed and wash the elephants. 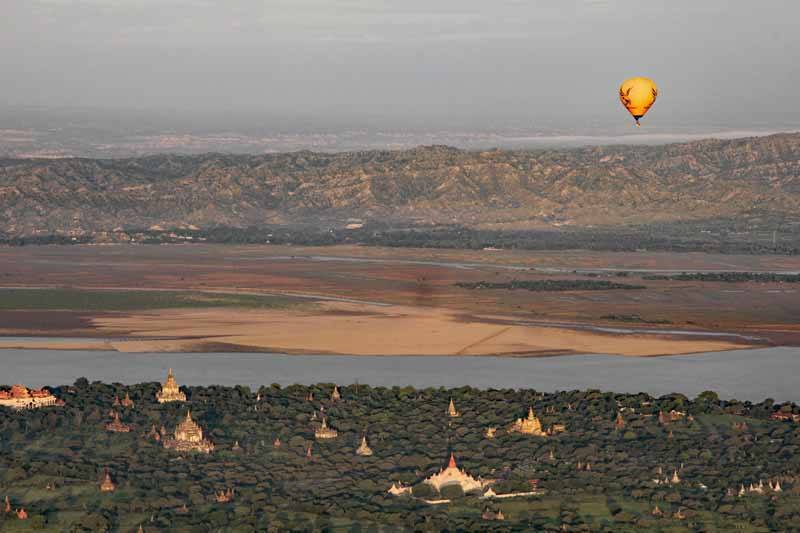 From the moment you arrive in Bagan you know it’s special. 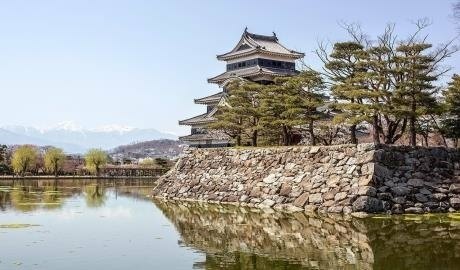 Everywhere you look you can see temples – from large, imposing structures covered in gold leaf to tiny crumbling temples no larger than a garden shed. And to see it by hot air balloon is magical. 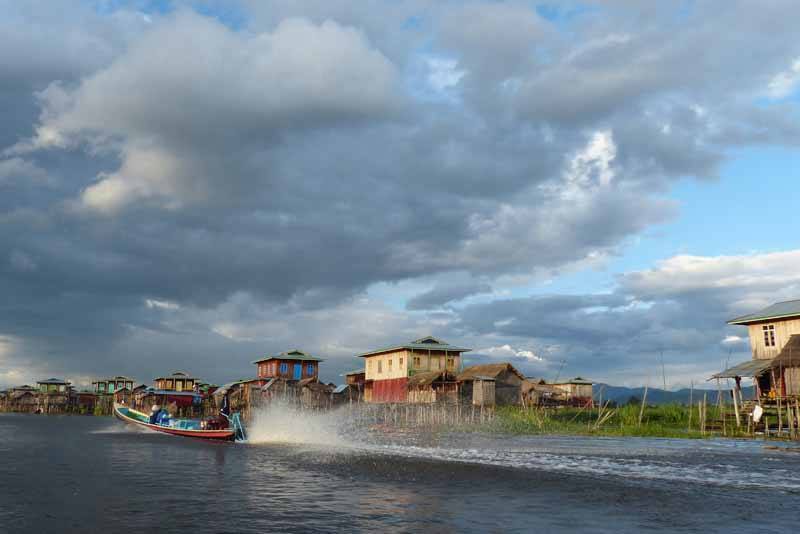 Inle Lake is a spectacular home to many thriving communities. You can see the fishermen at work on the lake, rowing with one leg, and not just performing for the tourists. You can sail through communities living their lives in stilt houses, shopping and travelling, cultivating their floating gardens, and even the kids coming home from school on the school boat. There are fascinating pagodas – including over 1000 stupas at Indein Village and the crumbling and mysterious stupas at Sagar. Food is freshly cooked in restaurants so you need to be patient, but it’s worth it as the food is tasty and very cheap. And where else can you get fermented green tea leaf salad? This tastes much better than it sounds. Chinese and Indian food are widely available and there is a fantastic restaurant on Inle Lake where you can get authentic Italian food, when you crave something Western. The Burmese owner of The Golden Kite is eager to take visitors around his kitchen and show them his fresh pasta machine and Italian ingredients. In the markets you can find all kinds of unrecognizable foods and a wonderful range of fruit and vegetables. The beer is reasonably good and the wine better than you might expect. Burmese food: a surprising highlight! But be prepared to scramble, clamber and get shaken to the core. The roads are not brilliant and often unsuited to coaches, so you have to walk, climb, or transfer to a pick-up truck to whizz round hairpin bends while hanging on tight. 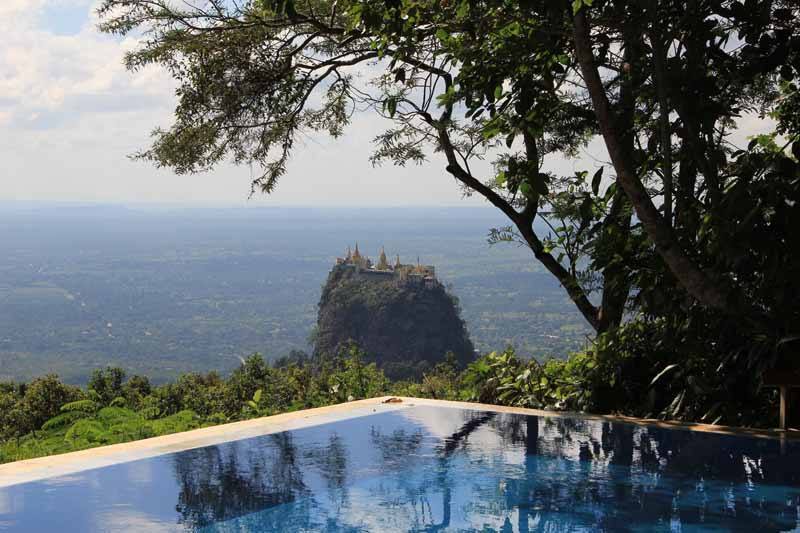 You need to be able to climb stairs, for example, Mount Popa has 770 tiled steps which you climb in you bare feet, which is well worth it for the wonderful views from the top. Just watch out for the monkeys though! …and one of its monkeys! And what other country in the world drives on the right while still using right-hand drive cars? What other modern city bans bikes so that the traffic in Yangon is in constant gridlock? Numbers one to eleven show the variety in this country. If you don’t enjoy one thing, you’re sure to enjoy the next! I’m sure I’ve forgotten some of the unique and remarkable things about Burma. Above all else the people are charming and the country is beautiful. Not to be missed! 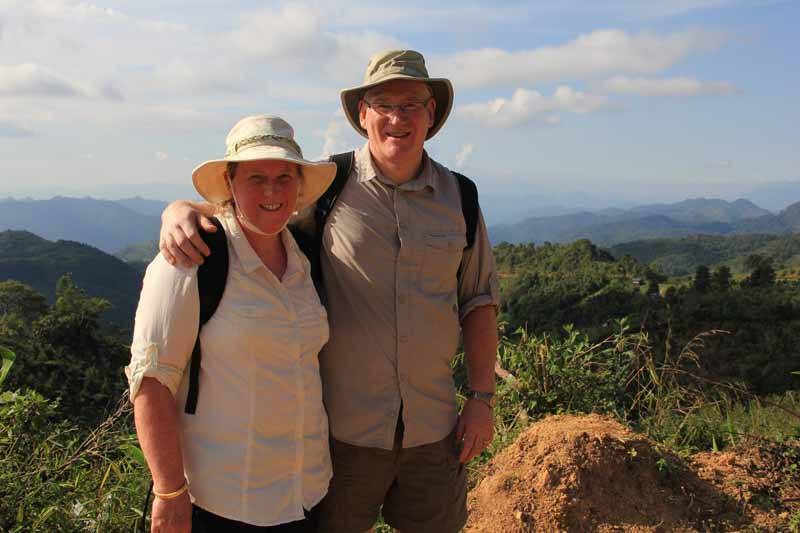 You can follow in Lesley & Alistair’s footsteps on our Beautiful Burma Small Group Tour. Just get in touch to book your place!